Using Alice, program structures are displayed as tangible objects, and students use a drag-and-drop interface to move tiles–people, animals, fantasy creatures, and vehicles–into an editor. Students can “flip a switch” to see the Java programming structures hidden behind the scenes. The Gaddis style, supported by Alice’s simplistic learning methodology, eases students into programming language and helps them recognize and avoid errors as they develop their skills. 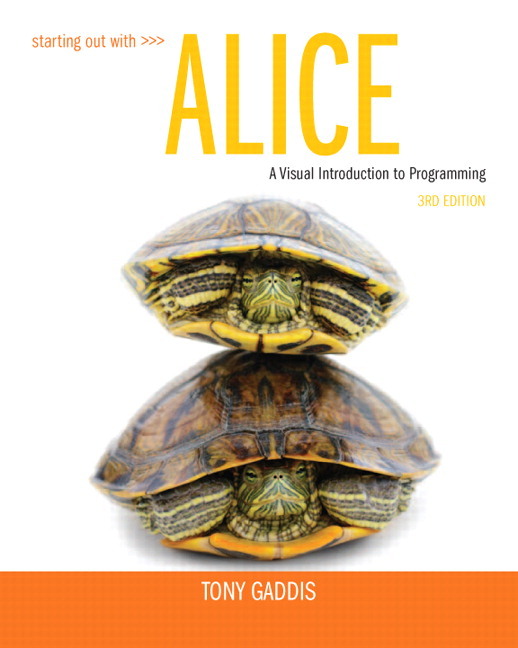 The full-color design complements the virtual Alice world, helping students to relate the text’s step-by-step explanations to the on-screen environment through screen shots. VideoNotes - An extensive series of online VideoNotes accompany this text. Created by author Tony Gaddis, VideoNotes provide extra examples and demonstrate how to solve problems. The VideoNotes are available to instructors and students through a password-protected companion website, located at http://www.pearsonhighered.com/gaddis/. An access code to the companion website is included with the purchase of a new copy of the textbook. Concept boxes throughout the chapter focus students’ attention on key topics. Notes explain interesting or often misunderstood points relevant to the topic at hand. Tutorials guide students through several exercises per chapter, ensuring student understanding of the material. Tips advise students on the best techniques for particular actions. Warnings alert students to common missteps or problems they may encounter. Checkpoints at key locations in each chapter check students’ understanding of important lessons. 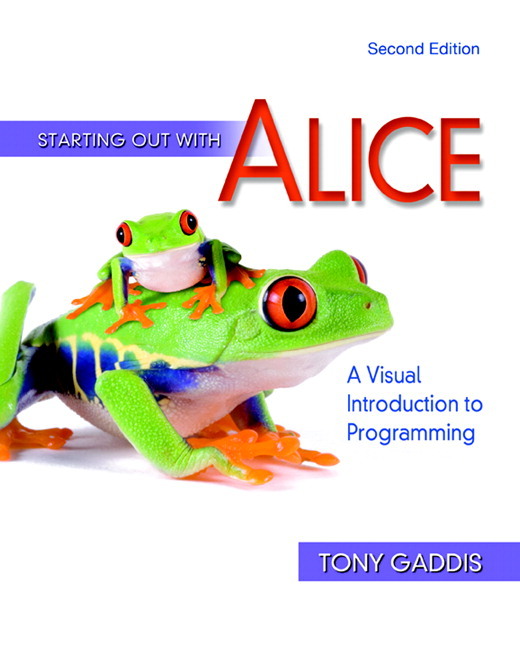 This text can be used in a variety of courses, from a standalone introductory course using Alice, as the initial teaching tool in a CS1 course, or for programming in a fluency course. A new tutorial on writing class-level functions has been added to Chapter 6. Additional programming problems have been added to Chapters 1, 4, and 5. A Java Language Companion booklet has been created to accompany this book, and is available for download from the book's companion Web site, at http://www.pearsonhighered.com/gaddis. The Java Language Companion demonstrates how the Alice programming topics that are taught in the textbook compare with their corresponding Java programming topics. The Java Language Companion is designed to correspond with this textbook on a chapter-by-chapter basis. Students who are studying both Alice and Java can work through both this textbook and the Java Language Companion simultaneously. Many of the screenshots containing Alice code have been enlarged for improved readability. When purchased new, this book comes with the latest version of Alice, which at the time of this writing is Alice 2.3. 1.1 What Is a Computer Program? Tony Gaddis is the principal author of the Starting Out with series of textbooks. He has nearly two decades of experience teaching computer science courses, primarily at Haywood Community College. Tony is a highly acclaimed instructor who was previously selected as the North Carolina Community College Teacher of the Year, and has received the Teaching Excellence award from the National Institute for Staff and Organizational Development. Tony, Haywood Community College 1981 Business Administration and 1985 Electronic Data Processing graduate, was selected as Outstanding Alumni Recipient for 2012 for the college. His Starting Out with series includes introductory textbooks covering Programming Logic and Design, Alice, C++, Java, Microsoft Visual Basic, and Python.